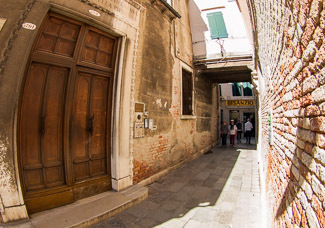 The Casa per Ferie La Pietà is a hostel-style B&B close to the Riva degli Schiavoni, the waterfront promenade east of the Piazza San Marco that is home to many of Venice's top luxury hotels. Accommodations range from beds in mixed dormitories to twins, triples, and quads with shared bathrooms. If you're on a tight budget but want to be near Venice's most popular sights with convenient access to public transportation (including airport boats), the Casa per Ferie La Pietà is worth considering. As you leave the Alilaguna Linea Blu waterbus station, turn right and walk to the stone bridge. Walk a few more meters beyond the Pietà church, and turn left into the Calle Pietà (right before the Hotel Metropole). Take the Alilaguna Linea Blu airport boat from the cruise basin to the San Zaccaria stop. Leave the cruise terminal by the main doors, walk straight ahead to the wooden bridge, and cross the bridge. At the ACTV vaporetto station (which is just ahead), take a No. 2 water bus in the direction of San Zaccaria. As you leave the boat station at San Zaccaria, bear right.